Wow. I mean, wow. 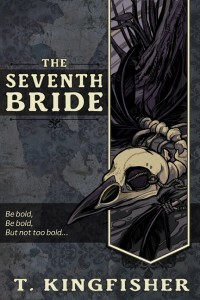 The Seventh Bride by T. Kingfisher (aka Ursula Vernon) is stunning. So freaking good. I’ve read three books so far this year that I think deserve big awards and this is one of them. The writing reminds me of Naomi Novik’s Uprooted and Cat Valente and Kelly Link. Kingfisher’s writing, however, is more pointed and observant, while being witty and delicious and funny and unexpected. I seriously love this book. I don’t want to give away too much, but Rhea is only 15 when a noble asks for her hand in marriage. The asking is more of a telling, as she has no real opportunity to refuse or her peasant family will suffer significantly. So she reluctantly agrees. Very quickly she begins to suspect he’s a magician, though that’s not a terrible thing. What really bothers her is that he’s rather a shifty, mean-seeming sort. He invites her (again, she can’t refuse) to visit his home and once there, she cannot leave. She discovers his terrible secrets and then must use her wits and her friendships to try to escape before very bad things happen to her. The worldbuilding in this story is incredible. I loved the golem birds and I thoroughly enjoyed Rhea. She’s smart, observant, and while afraid, she’s courageous as well. Crevan was seriously obnoxious in the best possible way, and I loved the other inhabitants of the house and the quirky magic within. Don’t get me wrong, there are a couple of things that niggle–a lot was made of Rhea’s name and I thought that would turn into more, and also, Rhea made some pointed observations and then didn’t go anywhere with them. Those were only a couple of things, though and the rest of the book was stunning and engrossing. One of those that I stay up stupid late to read because I can’t put it down. It’s coming out very soon, and you should preorder your copy. Seriously. Do it. You won’t regret it. This entry was posted on Friday, October 30th, 2015 at 10:26 pm in Reading, writers who are not me. Tagged: book review, book reviews, Reading. You can feed this entry. Both comments and pings are currently closed.